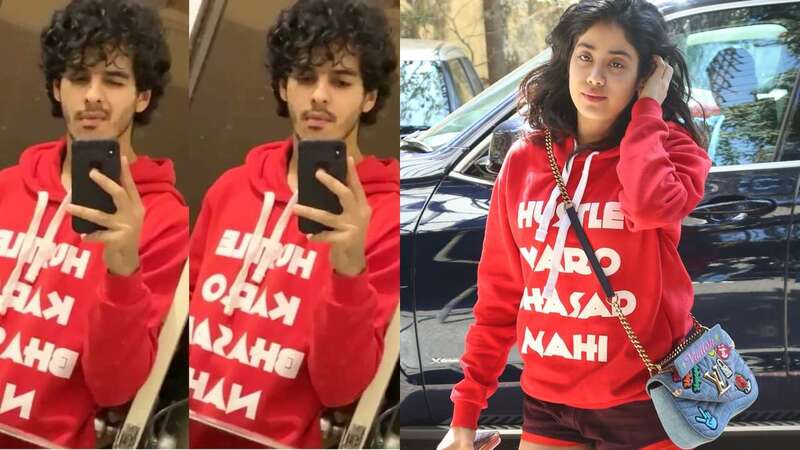 Feb 10 (AZINS) Janhvi Kapoor was recently spotted wearing quite an interesting hoodie outside her gym. What comes as a surprise is that the same hoodie was donned by her reported beau Ishaan Khatter. He wore the hoodie in one of his selfies. The red-coloured hoodie had the tagline ‘Hustle Karo Bhasad Nahi’. Janhvi paired it up with hot maroon shorts and denim Louis Vuitton sling bag. She completed the look with silver chappals. We are not sure what Ishaan wore with the hoodie since he took a close-up selfie. Ishaan and Janhvi both made their debut in Bollywood last year in Karan Johar’s production film Dhadak. It is also being believed that the movie got both Janhvi and Ishaan closer, so much that the two started dating. Both their brothers – Janhvi’s brother Arjun Kapoor, and Ishaan’s brother Shahid Kapoor, also almost confirmed the news on a chat show by saying that they are ‘buzzing a lot’ around each other. Janhvi and Ishaan often made outings, be it for movie screenings or gymming together. Janhvi had also celebrated Ishaan’s birthday at his house, in the company of Shahid, his wife Mira, daughter Misha and newly-born son Zain Kapoor. Dhadak was directed by Humpty Sharma Ki Dulhania and Badrinath Ki Dulhania helmer Shashank Khaitan. Ishaan had previously made his film debut with Majid Majidi’s Beyond The Clouds but got recognition through Dhadak. It was Janhvi’s first-ever-debut film, with the director who is soon going to collaborate once again with actor Varun Dhawan and producer Karan Johar for Rannbhoomi. Dhadak was a memorable movie for Janhvi for various reasons. She revealed that when she saw the original movie Sairat, which inspired Dhadak, she had told her mother Sridevi that she would love to make her Bollywood debut with such a film. As destiny had it, Janhvi did bag Dhadak and had her mother’s support till an unfortunate incident resulted in India losing its superstar Sridevi, just a few months before Dhadak was slated to release. Janhvi then came back on sets and shot for the remaining portions of the film, and if reports are to be believed, she got the most support from Karan Johar, followed by Shashank Khaitan and Ishaan Khatter.